Ever since “political correctness” jumped into mainstream public discourse as first a threat against higher education, then against free speech everywhere, and – with Trump’s campaign – a threat against the very security of our nation, I’ve been making one argument: Power matters. Mostly, it’s not a problem when marginalized people ask for others to use less pejorative language. Mostly, it’s not a problem when people ask to be warned before confronted with traumatic or upsetting words and images. When it is problematic, or even just annoying, it only becomes a speech issue when coupled with a power dynamic that enforces language edicts. Such power is most likely to reside among conservative (political and cultural) forces in our society. Example: Professor Melissa Click at Mizzou was way out of line confronting a reporter. But power resides in the conservative legislature that attacked her and got her fired. Example: The Dixie Chicks get blacklisted for saying they are ashamed of President Bush, but conservative country folks (or rockers like Ted Nugent) seem to be doing fine, no matter how much obscenity they fling at Obama. Example: An Ohio Attorney was jailed for contempt for wearing a “Black Lives Matter” pin to court. Attorney Andrea Burton was defending a client in court this past Friday, when JudgeRobert Milich of the Youngstown Municipal Court noticed her wearing a Black Lives Matter pin the size of a nickel. He asked her to remove the pin but she refused, resulting in Milich instructing the bailiffs to take Burton into custody for contempt.According to a news report from WKNB First News, Burton was forced to leave her client behind. That’s what censorship looks like – the power of the state being used to limit freedom of speech. Questioning Trump’s Sanity – Fair Game? Donald Trump is an erratic man with poor impulse control, a temperament that belong nowhere near the White House, and self-centered to a degree unusual even among politicians. He lies routinely. But does he lie pathologically? Are his lies related to a mental health condition which makes it difficult for him to tell the truth? Is his erratic and bullying conduct related to a psychological condition which could be diagnosed? Plenty of “Twitter psychologists” (not as many armchairs any more) have wondered if he has dementia, which sounds terrible, but we did have a president whom many people believe was entering early stages of Alzheimers while still in office. I am no fan of Donald Trump. I want him soundly defeated. Do we have to call him crazy to accomplish that? For months I’ve been saying no, and that’s still basically my position, but last night I had a long conversation on Twitter with, among others, the brilliant political writer James Fallows, science writer and professor Emily Willingham, and philosopher and disability rights journalist Elizabeth Picciuto. We all agree that Trump doesn’t have the temperament to be president. We disagree over whether we needed to frame temperament-issues in terms of mental health. Here’s the storify of the whole thing. I keep thinking about Thomas Eagleton, the VP candidate booted from the race because he dared treat his depression. The use of casually stigmatizing pathological language as a way of criticizing Trump’s conduct still feels to me like it’s out of bounds. Please pay particular attention to Deanne Shoyer, who identified herself as having a mental illness, and her objections. But the key here is the word “casually.” If there are genuine concerns about Trump’s conduct that suggest mental health issues – and of course he’s not releasing contemporary medical records, unlike every other presidential candidate in recent history – Willingham made the argument that we can’t simply take mental illness out of the frame of discussion. Silencing, she argues, is also stigmatizing. So we end up, as so often, looking for nuance. When Trump wildly contradicts himself, flies in and out of rages, says things that are patently untrue, and so forth – I don’t think I can flatly tell reporters: Any discussion of mental health is forbidden! What I’d like is for reporters, and all of us, to be intentional about the way we use language related to disability (and everything else). Being thoughtful about language will solve a lot of these issues related to stigma and discourse, and then we can just focus on beating Trump. When Donald Trump took to the stage in South Carolina last November and made fun of a disabled New York Times reporter, he won my vote…for Hillary Clinton. It wasn’t just that Trump’s behavior was appalling. No, what turned me over to Clinton is that, in the aftermath of Trump’s insult, she began running the most progressive presidential campaign on disability rights issues in U.S. political history. What’s more, once you start looking at her policies across the board, a pattern emerges. Hillary Clinton believes that government can help vulnerable and marginalized individuals. She listens to how such individuals describe their needs and then supports the best policies to meet those needs. It’s a progressive vision worth cheering, but it’s also a truth about her campaign that you might have missed. So there’s two points here. First, Clinton’s policies are the most progressive in US presidential political history. In the piece I lay out the details of the policy, compare her to Trump’s terrible record (beyond the moment of mocking a disabled reporter last November), and credit the movement for its advances – and, for that matter, the efforts of the Obama administration – as part of the reason Clinton’s plans are so well developed. It’s worth celebrating having a presidential candidate who talks about community integration, for example. That’s a big deal! But it’s also worth thinking about what this set of policies say about Clinton’s progressivism more generally. On foreign policy, I find her pretty hawkish, but when it comes to thinking about how the government can serve vulnerable people, I have to say I’ve been impressed. She listens (see Ezra Klein’s interview and Rebecca Traister’s feature on her campaign). She find experts. She develops and supports complex policy solutions to complex problems. To me, this is what progressivism looks like – a vision of government as helping the most vulnerable achieve equality of opportunity. Not everyone likes progressivism as a governing philosophy, and that’s fine, but this is what it looks like when providing the core philosophy for a presidential campaign’s domestic policy. Superhero (and related) comics are packed full of disability narratives, both good and bad, whether it’s the analogy between mutation and disability within the X-Men (not Professor X, but mutation as disability) or characters who have “real” disabilities of various sorts, though they often deal with them in high-tech ways. I wrote about Daredevil and blindness, here’s a top-10 list, and here’s a list of lots and lots of disabled comics characters. Among those characters is Cyborg. He’s black and disabled and an important character to many people in my community. Here’s some coverage from 2015 of the direction the storyline went and how disability was included. Here’s also a really interesting essay on the ways that black disabled superheroes tend to be physically altered to the point that they have trouble fitting in society, whereas white disabled superheroes get to remain fully included. Last week, the writer Son of Baldwin alerted me to an interview from San Diego Comic Con with the new writer of the series, John Semper. As I read it, he downplayed the disability context of Cyborg. I was concerned about this. It seems to say that “good qualities” would not include disabled. Moreover, it suggested that he saw disability only as impairment – not an unusual position – rather than a core marker of identity. I reached out to him and, to my pleasure and surprise, he wrote back. I’ve quoted some of our conversation below, with permission. It turns out that Semper was really talking about the previous Cyborg run, in which he felt disability was used to weaken the character. He wants to shift directions WITHOUT erasing disability. My comments were actually an extension of my disagreement of how Cyborg has been handled in the previous 12 issues of his comic book. If we consider him as “disabled,” then as a representative of disabled people, he was constantly being portrayed as someone for whom his disability was a major LIABILITY. What I want to have happen now is to change that perception of him. I want him to be seen as someone for whom his disability is just a given and in no way prevents him from being a true HERO. I don’t want his disability to stigmatize him as being “weak”, as it often was in the previous issues. I’m sorry if my words on the panel seemed to imply the opposite of what I meant. Sometimes under the hot lights, the words don’t come out exactly as you want them to. And I appreciated the young woman’s question which gave me a chance to clarify my meaning. She and I also spoke immediately after the panel. The good thing that came of this is that I am now more cognizant of Cyborg’s role as a symbol for people with disabilities and will certainly pay better attention to his representing them. I wrote back to talk a bit about disability as identity, referring him to a piece I wrote about Alice Wong, founder of the Disability Visibility Project, and the current state of assistive technology. Alice frequently likes to say, “We are all cyborgs.” I hope Semper reaches out to her and others I recommended as resources, as needed.. The only thing I can add is that, after thinking about our interchange, it occurred to me that in my second issue of Cyborg, which I wrote many weeks ago (I’m currently writing issue four), I created and introduced a brand new character who is blind, and I didn’t even think to mention it to you. And he’s somebody who gives Cyborg great advice on how to live with the fears and insecurities that his condition has engendered within him. In fact, last Monday I had a meeting with Geoff Johns, and Geoff is so excited about this character that he wants to see him become a recurring “mentor” to Vic. Perhaps, from this dialogue of ours, I might have Vic realize that Cyborg is a symbol for people with disabilities and begin to take that role more seriously. So that’s the interview. I’m enthusiastic about the future of Cyborg. On Monday, a police officer shot Charles Kinsey, a black therapist who was trying to help his client – a young Latino man named Arnaldo Rios – not get shot. Rios had walked away from his group home and someone called 911, claiming that a man was suicidal and armed with a gun. Rios, in fact, autistic not suicidal, and was carrying a toy fire truck. Kinsey got to the scene around the same time as the cops, lay on his back with his arms in the air to show the police he wasn’t threatening, and was trying to get Arnaldo to do the same when the police shot him. That’s the story we’ve known. I covered it here for CNN and in two blog entries. Now here’s some new information. UPDATE: Important piece from Miami Herald based on interviews with Rios’ family. Second – The Rios family has a lawyer, disability rights expert Matthew Dietz, who shared a picture of Arnaldo (below) and spoke to me over the phone. Dietz told me the following. Rios left the home holding a truck and Kinsey, with whom he had a close relationship, followed to help. After Rios saw Kinsey get shot, the police handcuffed Rios and put him in the back of a police car for THREE OR FOUR HOURS, handcuffed the entire time. Dietz told me that Rios, as is typical of many autistic individuals, calms himself by stimming – rocking his body and shaking his hands and arms. During those three or four hours, therefore, Rios was both upset at seeing his friend and therapist shot AND prevented from calming himself AND denied any immediate assistance despite everyone knowing they had taken custody of an autistic individual. NOTE FROM ME: If you want to know more about stimming and the abuse of being kept from doing it, from an autistic perspective, read Julia Bascom’s essay Quiet Hands. Rios was eventually taken to a mental health ward of a local hospital, where he remains, despite them being completely unequipped to address Rios’ needs. Rios cannot return to the group home, as earlier attempts left him showing signs of trauma. There are no other suitable facilities in Miami-Dade County to Dietz’ knowledge. Here’s the picture, which shows a smiling Latino man holding a teddy bear, sitting on a bed. I have a new piece up at CNN on the shooting of Charles Kinsey, protected a Latino autistic man named Arnaldo Rios [Edit: See below for correction information] and the intersections of racism, ableism, and the #CultOfCompliance. While the specifics of this case are unusual, the general pattern is not. Compliance-based policing — when police treat noncompliance with their instructions, on its own, as a threat — puts everyone at some risk. The piece is about racism and ableism, compliance-based policing like ask-tell-make, and exploring the broader pattern that led to the inexplicable specifics of the incident. Two things are missing from my CNN essay. First, after I filed, the officer, through his union, has claimed he was shooting at Arnaldo to protect Kinsey. I do not think this is credible, but is rather an attempt to create an “objectively reasonable” standard from which to defend his actions. It’s astoundingly brazen but again plays on the ableist idea that people with disabilities, especially non-white individuals, are erratic and prone to violence. Look at this picture. It’s just not objectively reasonable to conclude there was imminent danger and I hope both the department and the legal system agree with me. Second, though, why did the police arrive at the scene believing there was danger? That’s the 911 call which, according to our best information, claimed there was a person armed with a gun contemplating suicide. We don’t know who made the call, but we do know that Arnaldo is relatively non-verbal and was holding a toy truck when he wandered off from his home. Given those facts, how did someone decide he was suicidal and dangerous? I’m guessing – and that’s why I couldn’t put it on CNN – that this 911 caller was afraid of a Latino acting “odd” who was holding something in his hand, so made the call. I don’t know how we build systems to prevent this kind of 911 call. There’s got to be protections so that callers are safe to phone in suspicions without fear of reprisal, but we’ve also got to protect civilians from being targeted like this because their race, disability, or other markers of identity make someone uncomfortable. Reminder: Both John Crawford and Tamir Rice, to pick two names you know, were killed after 911 calls indicated threats where none existed (though Rice’s called said ‘probably fake’). Correction: The individual’s name was widely reported as Rinaldo, but is now reported as Arnaldo Rios. Changed in this and previous posts. Yesterday, this New York Times story went around on Trump’s plans to empower his Vice-President. ‘One day this past May, Donald Trump’s eldest son, Donald Trump Jr., reached out to a senior adviser to Gov. John Kasich of Ohio, who left the presidential race just a few weeks before. As a candidate, Kasich declared in March that Trump was “really not prepared to be president of the United States,” and the following month he took the highly unusual step of coordinating with his rival Senator Ted Cruz in an effort to deny Trump the nomination. But according to the Kasich adviser (who spoke only under the condition that he not be named), Donald Jr. wanted to make him an offer nonetheless: Did he have any interest in being the most powerful vice president in history? In an interview, Mitch McConnell showed he fancied himself, as I put it, Trump’s Cardinal Richelieu. Yesterday, McConnell told me that Trump has no “fixed notions” about major policy issues, and will heed Senate Republicans. As a historian, I know the story of the foolish but headstrong king surrounded by courtiers fighting for influence. On Facebook, in a discussion on the NYT piece, in fact, Craig McFarlane pointed out that Montesquieu described this pattern exactly in The Spirit of the Laws. The first thing a despot does, Montesquieu says, is appoint a Vizier to run everything, so that the despot can hang out and enjoy the luxuries of power. Meanwhile, Ezra Klein has penned an excellent piece about the dangers Trump poses to the country. Last night, a new story in the ever evolving evidence for the #CultOfCompliance and the dangers it poses to marginalized people when they encounter police went viral. 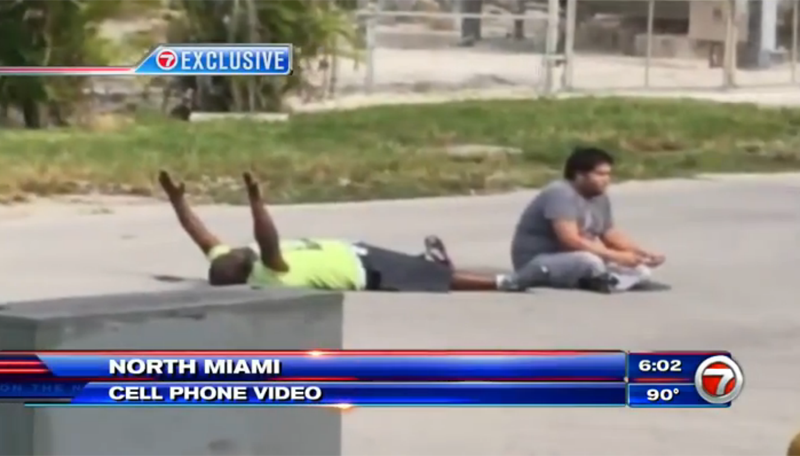 A police officer in the Miami area shot a black man lying on his back with his hands in the air. The man, Charles Kinsey, is a mental health professional who was trying to keep his client, a Latino autistic man (Arnaldo), from being shot. There’s both audio and video. Kinsey is going to be ok. Note that Arnaldo’s ethnicity has not been identified and I am making assumptions. Here’s how I parse this incident. 1. “Someone” calls police because there’s a big Latino guy with a gun contemplating suicide. But the man was in fact just out in the street with a toy train. 2. Kinsey, a mental health professional, knows this is potentially a deadly situation for the autistic man, because a) police are likely to perceive brown-skinned people (especially but not exclusively) with disabilities as not complying properly in the face of police commands* and b) police are trained to take non-compliance as a threat. So he goes to his client and lays down on his back, raising his arms in the air, both as a signal to the officer AND as a way to show Arnaldo** what to do to survive this. *Sentence edited lightly for clarity that this is about police perceptions. 7/21 8:20 PM CST. ** Correction: The individual’s name was widely reported as Rinaldo, but is now reported as Arnaldo Rios. Changed in this and previous posts. But also the officer comes in loaded with stigma that people with disabilities are unpredictable and dangerous, likely to lash out. 3. And then the officer shoots Kinsey. Kinsey asks why and the officer says he didn’t know, and that’s likely to provide some legal accountability in this rare case, as the officer won’t be able to retroactively claim he felt reasonably threatened (esp with video and audio). And then what lessons will we learn? Unless this is a pathway to reconsider compliance-based policing as a norm, nothing will change except for getting one officer off the street. Police said the autistic man had something in his hand, but Kinsey’s lawyer said it was a toy fire truck and could not be mistaken for a gun. Arnaldo does not “suffer” from autism. He was suffering from police officers threatening him. From Gawker’s coverage, here’s a still of the video. It shows a black man lying on his back with his arms in the air next to a man dressed in grey clothing, sitting cross-legged. Critically, no one is near them. As near as I can tell, there’s no reason for the officers to even have their weapons drawn, though clearly I don’t have a sense of the whole tactical situation. This is not like any case I’ve seen before in its specifics. I’ve never read about police shooting the mental health professional who was clearly identifying himself AND telling the officers that the client didn’t have a gun. But the generalities, the ways in which the #CultOfCompliance feeds into this incident, those I read about every day. Follow the “cult of compliance” tag at the bottom of the post for more. Wisconsin Senate Race: How Does the ADA apply to Private School Special Ed Programs? There’s a disability-related twist in the Wisconsin Senate race. Ron Johnson, as I understand it, has advocated both for special-ed private-school vouchers and keeping the federal government from inspecting such programs. Russ Feingold is against vouchers and, if we’re going to have them, at least advocates for them being regulated. Wisconsin U.S. Senate campaign rivals Ron Johnson and Russ Feingold disagree over Johnson’s plan to limit federal enforcement of the Americans with Disabilities Act at taxpayer-funded private voucher schools. Johnson denied his measure would harm disabled Children. But Democratic challenger Russ Feingold accused Johnson, in effect, of saying disabled students at voucher schools don’t deserve equal protection. If this develops, I might take a trip across the border, eat some cheese curds, and try to learn more. Here’s Michelle Obama. Absences highlighted, instead of copying.